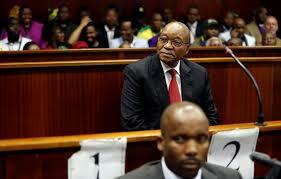 South African court adjourns Zuma corruption case to Nov. 30 – Royal Times of Nigeria. 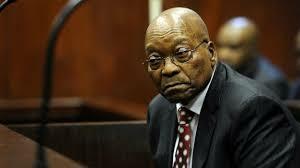 South Africa’s former president Jacob Zuma appeared at the Pietermaritzburg High Court on Friday on corruption charges relating to a two-point-five billion dollars arms deal in the late 1990s, but a judge adjourned the case to the thirtieth of November, 2018. Zuma, who appeared in court in a dark suit and red tie, faces sixteen charges of fraud, racketeering and money laundering relating to a deal to buy European military hardware to upgrade South Africa’s armed forces after the end of apartheid in 1994. The case is a rare example of an African leader being held to account for his actions. Zuma, who was ousted by the ruling party in February, denies any wrongdoing.